$19.95 In stock. Order in the next 1 hour, 18 minutes and it will go out today! The Flip Cup Gimmick is perfect for comedy performers, children's entertainers, emcees, stage magicians, parlor, close up magicians and street magic. The effects using the Flip Cup Gimmick is simple. While at a diner or on a stage you are holding a cup of soda, coffee, etc., and at your command you make a straw or in some cases a spoon appear or disappear. You are only limited to your own imagination with the Flip Cup Gimmick! 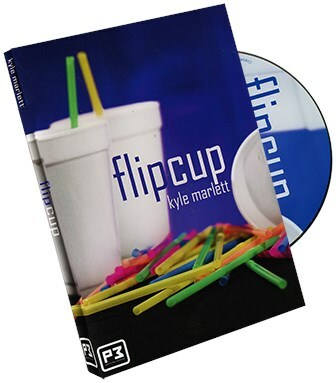 I love Kyle Marlett's style and Flip Cup is great! It's a really simple and smart gimmick. Really well made and self working! It can be put in pretty much any cup with just seconds of prep! This is so fun! I love it because it's so surprising! Just comes out of nowhere!